Last night I played Stranger Things for the first time, and I've gotta say, the game is really great. The biggest thrill for me was seeing the map tiles in action. This tile here figured very closely in the game we played. It was very cool to see everyone weave the map into the narration without really thinking about it consciously. I am so looking forward to our playtest!!! I can tell you that it's a VERY different experience than "traditional" gaming. Be warned, the GM can quickly find him/heself under the gun for ideas. During our playtest John commented that you may find that when the players make characters, your prepartion goes out the window. - Prepare a one paragraph situation for each player to explore. DON'T prepare any kind of outcome. DON'T expect (or encourage) a "party" of characters. I posted a few ideas for advenure seeds on the forum as examples. Tell the players that they are expected to either connect with the situation you pitch, or to spin up one of their own. - All of your NPCs are dying to spill their guts to the Stranger. They tell them things they would never tell anyone else, and try to enlist the Stranger into their schemes or cause. Don't stonewall or slow a Stranger's progress by making tight-lipped NPCs. Throw tons of adversity their way, sure, but always give them more information upon which to act. - When it looks like the Stranger is going to take action and resolve the situation, LET THEM. Even if it's ten minutes into the game. The point of ST play is for players to make judgments and affect change. If they go for it, let the resolution work itself out. Then toss them into a new situation -- possibly based on consequences from the first. - Expect a slow start. It took us about an hour to get all the cylinders firing, and 2 of us had played Trollbabe before. Once you have a few scenes and conflicts under your belt you will have generated more story material (in the form of NPCs and interesting places) and it will be easier to develop more scenes and conflicts. But the first ones will be tougher. - Let the players call most of the conflicts at first, and use whatever pace they suggest. - Explicitly encourage everyone to make sugestions for narration and scene framing, whether their character is involved or not. The game is waaaaay more fun if everyone is paticipating all the time. Our playtest was a blast. Tony's character ended up with a relationship with the Rune Tree. Phil's character took a relationship with the Witch of the Tower of Heartbreak Square. And Wil's character took a relationship with the moneylender who had (accidentally) stolen the Witch's heart. By the end, Tony had sworn to serve the Witch in return for some information about secret magical stuff. And Wil had struck a deal to keep some gypsies safe from the Witch's curse. Phil's character remained bound in service to the Witch, though he is starting to get ideas about being leaving if she ever gives him what she promised -- to make him human. All of the Witch/heart-stealing/bound-to-serve stuff was created by the players. It never occured to me that a Stranger would be anything but a totally free spirit, and now we have two of the three Strangers as servants to a rather unwholesome, demon-hating Witch. Very interesting. The great thing is, since Phil has the Witch as a relationship (he essentially created her, too) HE gets to say what she does. So the "servitude" of his character is almost totally under his control. Plus, he can make her order Tony's character around. I want to also point out an interesting thing that happend in play. The three Strangers started out in totally unconnected situations, but because of the map and player-initiative, all three stories were quickly woven together, using the Witch's tower as a focal point. I didn't have to "force" this as Director, and the game would have worked just as well if the three Strangers had gone off in seperate directions. I think the map helps provide great ammo for tying story threads together. It helps make the world concrete. When something happens, it happens HERE, which is close to this other place, which is connected to this player's story -- like that. And, like Tony said, the map creates unconscious material the the group may use without even realizing it. 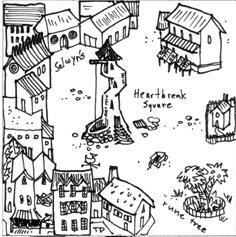 We had a whole story centering around a Witch who was bitter over an old lover who hurt her and it wasn't until the session was over that I remembered the map tile said "Heartbreak Square" across it. This sounds like a lot of fun! Are the map tiles in any way similar to your Danger Patrol geomorphs, John (it doesn't look like it, apart from both being tiles)? PS: Please sell this one in print -- it looks much too interesting to leave as a PDF! Egads I can't wait to play this game! Thanks for the GMing advice. I am not really worried about it - I have a great bunch of players and have enough experience to fall back on, but suggestions are always appreciated. Not big on the slow start thing, I don't typically have/give a game an hour to get off the ground, so i'll have to work on that aspect. Character gen looks quite simple so I am hoping that we can get right into things. I like what I've read so far and already have a bunch of ideas and hooks mulling around, subject to the characters the players create of course. Any more advice would be appreciated too. A bit off topic here, but I think it will be an interesting play-test with my group because none of us have played a game like this, but all have a really strong gaming background. It should give John some insight into what people new to the game/style will need/want. Actually, it's the "strong gaming background" that worries me a little. Stranger Things (like Trollbabe) just isn't played like other RPGs, and falling back on old habits can be game-breaking bad. Not "will be" but "can be." ST is definitely one of those crazy indie-games that needs to be played pretty much exactly as written, not "the way we always play." Ay caramba! I want this game. Also, you've given me some fresh inspiration for my upcoming HeroQuest run. Thanks! Actually, I believe John and Wilhelm created the witch, as they established that the curse on the gypsies was emanating from that tower, and someone established that the figure doing the spellcasting was a woman. But I was the one to decide that the woman my character was waiting to meet was that same spellcaster, that she was the one to give me the golden anklet I chose as my human item, and that her name was Morai. So I named her and pushed her (and my character) along the story path that John and Wilhelm and Tony were already converging upon. I find it interesting that you equate strong gaming background with playing "like we always play". I could go off on my own rant about people's misconceptions based on limited information, but I won't. We are open-minded and willing to learn and have been playing creatively and to have fun and develop stories for years, just not with a system like this one. All of my players "get it". I wouldn't have invited them to play-test otherwise. Still, a worthwhile discussion if you want to give some advice or script I should give them on how this will be different than my usual game. You're right, Roger. I jumped to the wrong conclusion. Sorry about that. I think I'm a little gung-ho after dealing with one too many people online who most definitely do not "get it." You know John, if haven't already copied that "crash course on GMing Strangers" over into the Strangers document, you should do so immediately. Well, we have to agree to disagree on that one, Roger. There's not only going to be Director techniques (like those above) in the book, but LOTS more stuff like that, besides. Lots. This game is going to be VERY explicit about how to play it in every respect, trying to assume nothing about the person reading it. Excellent. I think every game--board game, card game, RPG--should be like that. Imagine if you opened up the box for Risk and read in the rules, "You've played Monopoly, right? Okay, let's skip to how this game is different then..."
Wait, so then what would the instructions for Monopoly say? "You've played checkers, right? Well this is nothing like that..."
I agree with what I think Phil is getting at which is that the game should defintely explicitly say how to play it, but the comparision to other games is not necessary. Who cares if you've played monopoly, this isn't it! As part of the intro to hook players in, fine, but don't dwell on it. Maybe we're talking past one another. I agree, comparisons to other games aren't necessary. Which is where, I think, most RPGs fall flat--they explicity refer to other RPGs (by name, or by type of game) or otherwise assume that the people reading the rules know what the hell an RPG is. I think that's kind od wacked, and is a major stubling block for new people entering into the wild and wacky world of RPGs. I feel RPGs would be stronger if each and every one were designed and presented as if it were the only game of its kind in existence, and everything about play was explicitly laid out. That's what I'm reading John saying about Stranger Things, and I applaud that. Where's the Indie Game Success Story?